The stela is almost rectangular, with a slightly curved top. On the upper half is a representation in low relief, on the lower half a Greek text in two lines is engraved. The scene is bordered by a base line, two uas-sceptres and an elongated sky-hieroglyph (Gardiner N1). Under the sky is the winged sun disk, from which two uraei hang down. In their turn, they support two shen-rings. Two horizontal ostrich-fans cross these signs. Underneath stands the king, dressed in the ceremonial protruding kilt with tail and provided with a broad collar and the Double Crown. He offers a statue of Ma'at to Miysis who is crowned with a sun-disk and uraeus and standing on a simple, high pedestal. Between them a small offering-table with a lotus is placed. Both the king and Miysis have legenda in hieroglyphs. 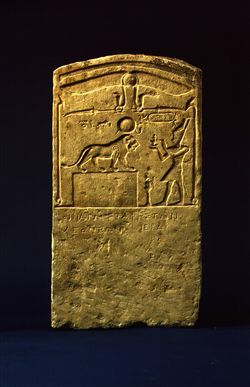 Chisel marks on the lower part of the stela suggest that something has been erased before the Greek text was inscribed. H.P. Blok, Het huis der Leeuwen in Leontopolis, Bulletin Antieke Beschaving II,2 (1927), 10ff.